After I completed my Foot ID analysis, I was recommended to try ASICS Gel-Nimbus 19, one of ASICS’ long-selling long distance running shoes. Gel-Nimbus newest version delivers a lightweight and comfortable shoe with improved responsive cushioning for neutral runners and under-pronators. Well, before you decide to buy any running shoes, I would suggest you go for your FOOT ID analysis first. This is to determine the right types of running shoes types for your feet. I have a normal arch, a normal pronator, meaning I’ll do best in a stability shoe that offers moderate pronation control. Gel-Nimbus 19 features ASICS’ patented midsole technology FlyteFoam that offers lightweight together with better responsive cushioning. This latest model is designed to help neutral runners and also under-pronators run long distances so they can perform their best from start to finish. I am running on ASICS Gel-Nimbus 19 since beginning of this year and also during my recent Tokyo Marathon 2017. I’ve tried running long distance in our hot and wet weather and also cold and windy weather in Japan. It is suitable for road, treadmill, and flat hard soil or cinder trail. Gel-Nimbus is best for long distance easy pace training, half marathon or full marathon. The Nimbus 19 Flytefoam midsole which make the ride firmer and the upper changes reduce forefoot and toe-box space. When weight is applied on the rearfoot, there is bounce effect coming from the firm midsole splaying downwards, and this gives the Nimbus its small degree of responsiveness. 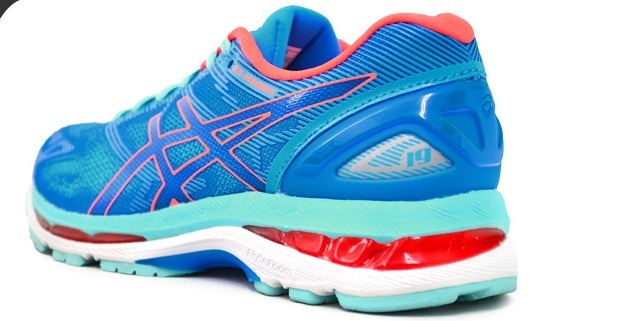 Overall, ASICS Gel-Nimbus 19 is well-cushioned with an added emphasis in midsole protection and responsiveness. The ride firmness increased means a slight improvement in stability and transition. The shoe feels faster to run in with improved responsive cushioning, lightweight, and comfort ride. The increase in ride firmness also means a slight improvement in stability and transition manners over the 18. The midsole is a tad more supportive, and the shoe feels faster to run in. Not that the Nimbus was meant to be a quick shoe, but hey, we’re just saying it the way it is. Availability: ASICS Gel Nimbus 19 is available for men and women at ASICS stores in Malaysia and selected retailers and running specialty destinations nationwide. The Asics shoes looks nice. I would prefer it in pink though hahahaha. Indeed, getting the right pair of shoes is absolutely important as if affects performance. The price tag is really reasonable, too. Love those shoes!!! I'm thinking of buying one as I want to start living healthy. thanks for sharing! Still thinking which running shoe to buy. I looking between Asics and Adidas. Seem Asics offers a good protection to our foot and the design attractive. Agh! In love with this teal blue color. Wow this sporty shoes looks comfy! Do they have this in grey or white? Klang Parade Hot Mama Contest for 2017 Is Back!